​LASER 3284 hosted, sponsored, and ran the Mid MO FTC® Qualifier. 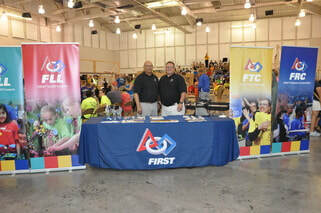 This event brings MO FIRST® teams to the Ozarks to compete and share FIRST® with the Lake Community. The 2014 event was held on December 13th, 2014 from 8 AM to 6 PM. LASER 3284 hosted the annual Mid-MO FLL® Qualifier that brought teams from central Missouri and beyond together for a day of Gracious Professionalism® and Coopertition®. At this event, 3284 also exhibited FLL Jr.®, FTC®, and FRC®. The Camdenton community supports the LASER program by helping to provide 130+ volunteers to make the day successful. 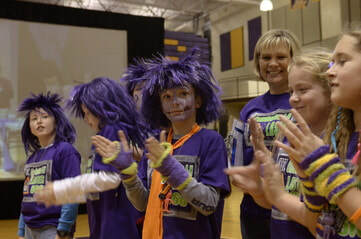 The event was held on November 15, 2014 at Camdenton High School. The Drive 4 UR School event, sponsored by Sakelaris Ford, has become much more than a fundraiser for the FIRST® LASER programs. 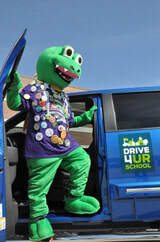 Sakelaris proudly supported LASER by hosting a full day Drive ONE 4 UR School event. At this event, community members were invited to test drive Ford vehicles. Sakelaris and Mid-West Ford donated $20 per valid test drive, up to $6,000 to the LASER program. In addition, Mid-West Ford hosted a Facebook voting competition to double the donation. LASER was fortunate enough to win the bonus competition! Thank you Sakelaris and Mid-West Ford! Additionally, LASER was able to showcase all four progressions of FIRST® ​ ​for the entire community! 4-H and LASER partnered to host a summer Sea Perch camp for 5th and 6th grade students. This was an exciting week-long camp where students built an underwater robot that was able to navigate underwater obstacle courses! The camp ended with an exciting underwater robot competition run by LASER 3284. ​LASER 3284 co-hosted the off-season Show-Me Robotics Event in partnership with 4-H, The Corps, and Team Scream from Sedalia, MO. This event took place at the Missouri State Fair, where several thousand attendees are introduced to all four progressions of FIRST® . 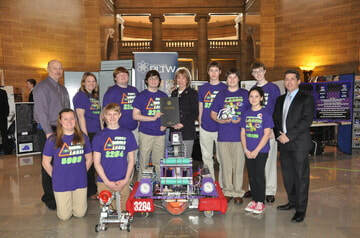 ​Governor Jay Nixon declared April 2014 to be FIRST® Robotics month in Missouri, on behalf of LASER 3284’s efforts to share STEM! This proclamation coincided with the 2014 FIRST® World Championship that was held on April 23-26 at the St. Louis Edward Jones Dome! On March 6, 2014 LASER represented all four progressions of FIRST® programs at the Missouri State Capitol in Jefferson City for STEM day at the Capitol. Read more about this event and watch the Capitol highlight video that featured LASER students.